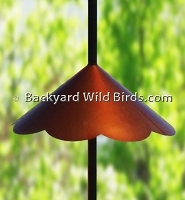 A Bird feeder pole that stops squirrels and makes a Squirrel Proof Bird Feeder. A Shepherd Staff pole has cone squirrel baffles below to stop squirrels from climbing up the bird pole. 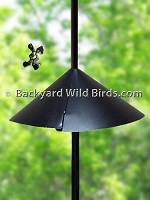 Cone squirrel baffles can be attached to most any 1" diameter pole or less. Standard Shepherd staff poles are 1/2" square steel and heavy duty Shepherd staff poles are 5/8" square steel wrought iron. Shepherd Staff Wrought Iron Pole that has double hanger arms and a quick connect middle makes a great bird feeder pole. Pole uses 1/2" square steel. 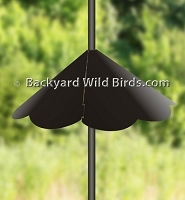 Get wrought iron shepherd staff pole set, block squirrels with the 17" cone squirrel baffle and shield bird feeders with choice of 2 metal weather baffles! Shepherd Staff Super Duty Pole is a heavy duty wrought iron pole. The pole has 4 hanger arms each having a reach of 13". The pole has super strong 5/8" square steel main shaft and 4 detachable arms.